Soak the tkeokbokki for 20 minutes if hardened or refrigerated. Cut into 2 inch pieces along with the cabbage and scallions. Add the prepared Knorr® Ultimate Fish Base (or water can be used as a substitute) to a large pan. Stir in the sauce ingredients; gochujang paste (red chilli paste), gochugaru (chilli pepper flakes), soy sauce, sugar and minced garlic cloves. Bring it to a boil over medium high heat, stirring to dissolve the gochujang. 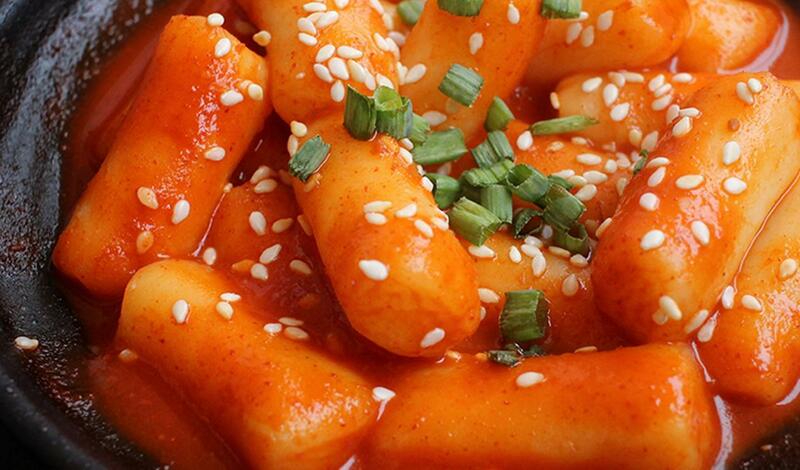 Add the Tteokbokki and boil for 8 to 10 minutes, or until they are very soft and the sauce has thickened. Stir frequently so the Tteokbokki doesn’t stick. Add the vegetables and eomuk. Continue to boil, stirring constantly, for 4 to 6 minutes. Add the sesame oil and sesame seeds (if using) just before turning off the heat. Serve immediately.